This is hands down one of the tastiest dishes I’ve made so far via sous vide, and to top it off, it’s crazy simple. The sous vide cook time is a mere 2 hours for the lamb chops plus any additional time for your side dishes or other accompaniments. Personally, I love lamb chops served with roasted vegetables like red and orange peppers, onions and asparagus. An alternative is to serve it with a grilled soft fruit (my personal favorite being peaches when in season). Heat the sous vide bath to 136 for medium rare or 140F for medium. 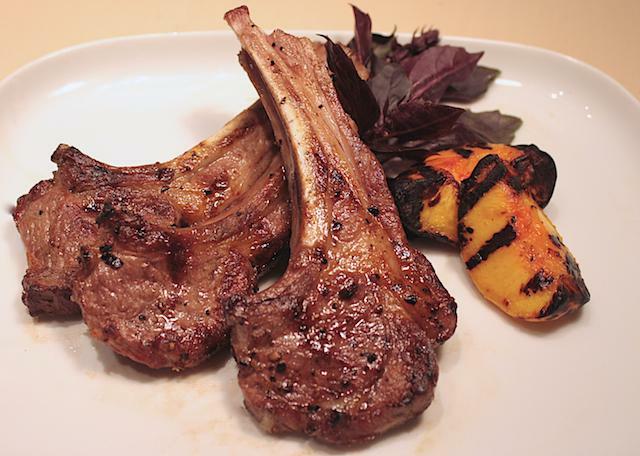 Drop the vacuum-sealed lamb chops into the sous vide bath for 2 hours. You can cook up to 4 hours with any change to the texture. When the time on the lamb has almost elapsed, start heating up a cast iron pan on medium-high heat. Once the 2 hours have elapsed, open the bag and pat each of the lamb chops with a paper tower to remove all the excess moisture. This will ensure you get a good sear. Don't worry if you remove the rosemary, it's basically done it's job already. Melt the butter in a small dish in the microwave so it's melted through. Make sure you don't burn it. Add the minced garlic and onion powder to the butter and stir it so it's combined well. Baste each lamb chop with a thin coat of the herbed butter mixture. Serve with roasted vegetables and/or a star of your choice like rosemary roasted potatoes. Tried this recipe with new machine, chops amazing. Only thing was cooking at 60 they were barely warmed through (although cooked) Even after being on the hot grill pan. Can I do anything to raise the temperature after the water bath? Hi guys, great to see some more home cooks into sous vide. Re Catherine’s comment above….you can put your chops into a pre-warmed oven (about 100C) on a pre-warmed plate and that will slowly heat them in about 5 mins. But I prefer to sear the chops on the BBQ first then add herbs etc to chops and bag. That way I still get the smoky flavour of the BBQ without the tough chops. Hi guys, great to see some more home cooks into sous vide. Re Catherine’s comment above….you can put your chops into a pre-warmed oven (about 100C) on a pre-warmed plate and that will slowly heat them in about 5 mins. But I prefer to sear the chops on the BBQ first then add herbs etc to chops and bag. That way I still get the smoky flavour of the BBQ without the tough chops. and another thing….you don’t need to use a vacuum sealed bag for relatively short periods of cooking time. You can use a zip-lock bag and evacuate the air using the displacement method.